Heat 10-inch skillet over medium-high heat. Add oil; rotate skillet to coat bottom and side. Cook chicken in oil 3 minutes, stirring frequently. Stir in bell pepper and onion. Cook 3 to 4 minutes, stirring frequently, until vegetables are crisp-tender and chicken is no longer pink in center; remove from heat. Stir in salsa; set aside. Stir Bisquick mix and very hot water in small bowl until soft dough forms; beat vigorously 20 strokes. Press dough in pizza pan, using fingers dipped in Bisquick mix; pinch edge to form 1/2-inch rim. Sprinkle 3/4 cup of the cheese over crust. Top with chicken mixture. Sprinkle with remaining 3/4 cup cheese. 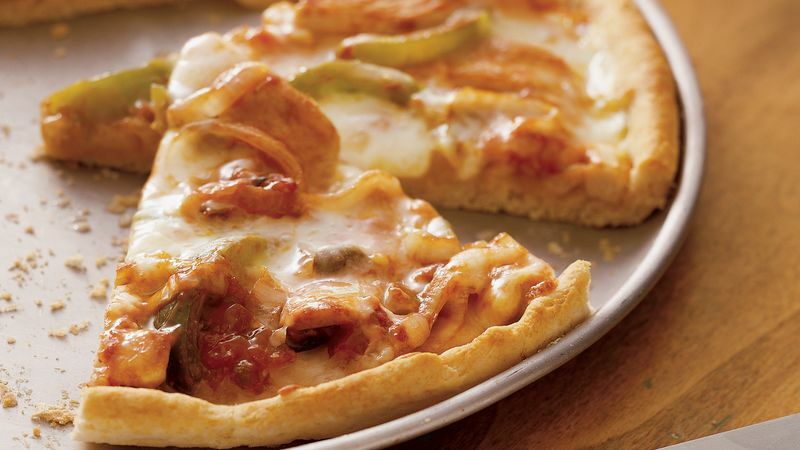 Bake 12 to 15 minutes or until crust is brown and cheese is melted and bubbly. Family time in the kitchen? It could save time. Young children can set the table, wash vegetables and load the dishwasher. Older children can shred cheese, cut up vegetables and help assemble recipes. Sprinkling part of the cheese onto the unbaked pizza crust helps prevent the crust from becoming soggy. The cheese will separate the crust from the moist toppings.